Welcome to the "Pink & Blue: Babies Are Due" Giveaway Hop hosted by Mommy's Favorite Things and Mama's Baby Cupcakes. Join us in celebrating babies by honoring Michelle's baby girl born this December, and Heather's baby boy set to arrive in January. This hop is focused on items you'd want/need for babies ages newborn to 6 months of age. Whether it's bottles, blankets, toys, or clothes, I'm sure you'll enjoy what all the bloggers have to offer. After visiting my giveaway, make sure you use the linky below to take a look at what the other blogs have to offer! Each blog has a minimum prize package of $25 per winner. I recently had the opportunity to review a Lotus Bumz Cloth Diaper. I am a cloth diapering newbie and although I don't really know much about cloth diapers, I was impressed with the Lotus Bumz features. And since we don't know whether we are having a boy or girl, Lotus Bumz sent me the Gray Chevron to review. I think this diaper is so cute. I love all the many features and how easy it is to adjust. Lotus Bumz listens to their customers and provides them with patterns that they want at an affordable price. I'm excited about my giveaway! One lucky Nanny to Mommy reader will receive the opportunity to win a Lotus Bumz Cloth Diaper of your choice and an Amber for Babies Teething (read my post) necklace of your choice (between The Honey Raw Beads Amber Necklace or Lemon Raw Beads Amber Necklace)! $48 value! Entry is simple. Just enter the Rafflecopter below. All entries are verified but the only required entry is to comment on this post. Open to US only, must be 18+ to enter. Enjoy! 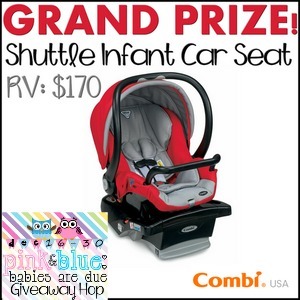 Combi USA teamed up with Heather on a Shuttle Infant Car Seat review, and they've also offered a giveaway! One US winner will win a Shuttle Infant seat as seen in the button above, with their choice of colors (black, red, royal blue or teal) ENTER THE GRAND PRIZE HERE!!! We will be cloth diapering this time around too! I can always use another diaper in my stash, and I keep hearing about the wonderful benefits of amber for teething babies. I would like to win a Lotus Bumz cloth diaper because I've never tried one before and I am building my stash for when baby arrives in January! I would like to try the teething necklace because, well, wI would try anything when they're teething! I would love the diaper and amber necklace for my youngest son! I'm due in just 4 short weeks. This time I want my baby to wear amber from birth and we also will be using cloth diapers. So this package is perfect for us! I'd love to win both because we are on a very tight budget and I'm trying to build up my cloth diaper stash - plus, I know the amber necklaces help out tremendously when it comes to teething! My husband and I have decided to cloth diaper our 6 month old (disposable diapers just give her the worst rashes!! ), I've never tried an Amber teething necklace before but I have heard wonderful things about them. I would be interested in trying one. I have an almost 2 year old and found out that I am pregnant. I am in need of a lot of baby items. I thought the 2 year old was my last and haven't kept anything. I would love both for my baby due in May! I would like to win these because I have a second baby on the way due Feb 20th and I never got to try these products with my first one, I would love to try them! I've always wanted to try an amber necklace for my daughter! We are currently TTC our rainbow baby after a really hard year (husband laid off 3 times and we lost our son at 35 weeks) and now that im working again things are still tight so anything extra is a godsend. I'd like to win the diaper for a friend of mine that is just getting into cloth diapering, and my daughter is 6 months and will be teething soon I'm sure and I really want an amber necklace to help with that! I'm pretty addicted to cloth diapers. I love to try different kinds. I haven't tried lotus yet. Also, I think baltic amber jewelry is beautiful. Would love to have a necklace for my daughter! I would like to win another cloth diaper for our stash. I've never tried an amber necklace on my son, but would be willing to. I'd like to try cloth diapering and the necklace is so cute and such a good idea. I'm helping a couple of local moms get started cloth diapering. I would love to be able to give this diaper to one of them! My son has started teething and is a drooling mess. I would love to try an amber necklace for him! We are expecting our first child soon and we would like to cloth diaper. I'd love to try a lotusbumz diaper, and I have a friend who could really use the teething necklace! I'm about to be a first time mom and I'd love to try these both! I have been really wanting to try an amber teething necklace for my little one - and I love trying new cloth diapers! I would love to win these for my friend who is expecting. I have a new nephew who is being cloth diapered and could use an amber necklace. So either one would make a fantastic gift for him! I'd like to win because I'm planning on cloth diapering and I've heard that amber is great for teething! I loved the amber teething necklace when I had one for my 2.5year old. I'd love another for my almost 6 month old. Ive always thought of trying cloth so I'd love to win this. I'm trying to get my sister to be a bit more crunchy and these would be perfect gifts for her! We have a baby coming in January and we're building up our stash. I'm trying to build a cloth diaper stash for next time. I have wanted to try cloth diapering so this would be great to give it a try. I'd love to win these for my first baby was was due 3 days ago LOL! You can never have too many CDs! Our baby is due in a few weeks and both of these items would be handy. I have a baby now that loves cloth diapers and is beginning to get teeth so the amber necklace would be good. We can always use more cloth diapers and a new amber necklace! I'm due to have my first baby in 2 weeks and planning to cloth diaper. I have some newborn diapers, but some that will be longer lasting would be great. And I love the necklaces. I would really love to win the these prizes because im planing on cloth diapering my 5 month old son in jan and he is teething so bad the amber necklace would sure help him out!! I'm pregnant with baby #2 and love the Bicycles print. This would be great for my boy, since his great grandfather had a bicycle shop for many years. I would love to try a new diaper (my husband says I am obsessed!) and would love to have an extra amber necklace for when my little one is teething! I would love to try out the teething necklace. I've heard great things from other mamas. I also would love to get a stash going for if we have baby #2. I love the prints Lotus Bumz offer and I would love to try a teething necklace. I've been wanting to get an amber necklace, but my husband is not convinced they are worth the money. And you can never have too many diapers! We are trying to conceive and this would be great to add to our stash of stuff! My sister is due with her 3rd (surprise!). She donated all her CDs after the 2nd, so she has to start fresh! and I would love to try out amber jewelry to see if it works! I have 2 children in cloth so it's always nice to have some extra diapers. I would like to win because my niece is due soon, and I am going to attempt to convince her cloth is the way to go! My cousin has a baby girl who would be perfect for this giveaway! I have a 3 month old that that would look cute in it! I would love to try the Lotuz Bums diaper as I am very new to cloth diapering and I would like to try as many different diapers as possible! I would also love to win the teething necklace because it's beautiful and I don't have one! I'd love them for my daughter. She's having trouble with teething. I'd like to win for my youngest child. I'm a big cloth diapering fan and would love to try out Lotus Bumz- I don't have any of their diapers yet! And my first child had horrible issues with teething- I'd love to have the amber necklace for the baby we're expecting next year! I'd love to expand my stash, and try some different brands, and my son just started teething! I would like to win because I have never tried either! And I always need new diapers! Im really interested in starting to cloth diaper, I think it would save a lot of money. I'd love to try the Lotus Bums and with 2 in diapers another diaper wouldn't hurt. We have an Amber necklace for my son and would love one for the baby due in April because they work really well. I love trying new diapers and have been wanting to see if an Amber necklace would help my little teether. I did not use cloth diapers on my first child 11 years ago and am looking forward to cloth diapering the baby thats on its way. The teething neckless looks great last time very little worked so I am looking forward to trying the amber. My little one is due in Feb and I am stocking up. Always looking for new brands to add to the stash! I'd love the diaper to round out my stash, and the necklace for my grumpy, teething little lady! I would like to win these because I like the idea of going green and using homeopathic treatments. Both these would make awesome additions to my growing first baby collection. My son is teething now and I've never tried amber necklasses so I'd like to give it a shot. I also always love to try a new diaper. I would love to win this for my son. I have been wanting to try cloth diapering for a while now! We use these products already, and you can never have enough cloth diapers, right? My little guy looks so cute in the Amber necklaces. I want to win this for the baby we will have next year. I think that cloth is so much better for my skin so it will also be better for my kids skin. I would love to win this because I have two in cloth and my middle child needs a new necklace :) thanks for the chance! I'd love to win for my little one on the way! i'm building a CD stash for my son due in January! My sister is due in January and she would love these. I would love to try out a new cloth diaper, my daughter was just born and I've been slowly building up my stash of diapers!! The necklace would be great for when she starts teething in a few months!! I'd love to win because my youngest could use the diaper and my oldest has been wanting a cool looking amber necklace! we have #2 due very soon and would love amber for her and need a few more cloth diapers for 2 in cloth! I'd love to try a new diaper and Lotus Bumz has some adorable prints... and I haven't tried an amber teething necklace yet and would love too! I would love to win the amber necklace because I have infant son who seems to be starting to teeth already. Also I love trying new cloth diapers and increasing my stash. I have a 2 month old who we use cloth diapers on part of the time, and I'd love the amber for when teething does start. I love one size diapers and especially need some pockets for night times. I have heard great things about the amber teething necklaces, would love to try it out. Leave a comment telling us why you would like to win a Lotus Bumz Cloth Diaper & an Amber for Babies Teething Necklace? I would love to win a Lotus Bumz Cloth Diaper because I need more diapers and I have never tried on of these. I do not know anything about an Amber for Babies Teething Necklace but would like to try one. I am a soon to be FTM and would love to try cloth diapering and the power of amber!!! I'm expecting my first baby and NEED to build up my stash of diapers!! The teething necklace would be PERFECT for when my LO starts teething! I like the blue owls print diaper and the necklace would be great for teething time. I would like to win because the diapers don't require a cover and the teething necklace is individually knotted between each piece. I would love to win a Lotus Bums (in the icy foxes pattern) because I am really only familiar with the old school cloth (diaper pins and all that my mom used for my much younger brothers ... and suddenly I feel old...) and gDiapers but am aware that different types of systems work better for some. While I have had only good results from gDiapers I am expecting in March and would really love to see. plus a very dear friend is also a fan of cloth and her son was just born so we have been trading tips, thoughts, etc.. and... we try to stay on the minimal at best chemical side of things (with the definite exception of emergency/trauma medicine) so I am very interested in the amber for this baby when we get to that point. plus, I make and repair a lot of jewelry so the individual knotting gets two thumbs-up for me. thank you so much! I've never tried a Lotus Bum diaper, and I have a 3 month old that I'd love to try a teething necklace on in a few months! with #2 coming, I'm rebuilding my stash (and adding boy prints to it! I'd also love to try a teething necklace - sometimes i wonder if that would also help my toddler out! My son's good friend since kindergarten is expecting his first baby....I would give these to him and his wife for Baby Oliver! id love to win and try this brand of diaper for the first time. they look really nice and amber necklaces are great to give as gifts! I really want to cloth diaper and currently have none. I am trying to build up a stash. I'd also like to try out the amber necklace. I've heard great things. My first grandson is due in 2 weeks and I would love to win this for him. I've had my eye on the amber teething necklace. I love the "natural" aspect of it. I have never tried a lotus bum diaper, so far just Glow Bug, but I am looking to expand my stash! I like the Amber Teething Necklace, because it is a natural way to help babies while they are teething. I would love to have these products for a baby gift for my cousin. They both look great. We're just starting to build up our stash and I'd love to have a variety of diapers. I'd like to win because 1 - you can never have enough cloth diapers and 2 - because my LO is teething like crazy and loves to chomp on everything so I'd like to try the necklace. I like Lotus bumz because they are good quality diapers that are very affordable. I like the amber necklaces because they help with teething pain and look so cute on babies too. Due in March and need some diapers! Would like to win for our new 1week old little girl. i would love to win these for my baby sister who is due with a boy in 2 weeks! I have been trying to transition into a greener life style and cloth diapering would def save the planet and my wallet. Plus cloth diaper booties are so cute. Also, I've heard rave reviews about the amber teething necklaces and would love for my LO to try one. I'm expecting my first baby in a few short months and am trying to build my CD stash with different styles and brands to see what we like best. I love what I've read about amber necklaces for teething, too! I'd love to win because i am brand new to cloth and need to build a stash!! Plus i have a teething little girl and we are both dying over here! I'd like to win a Lotus Bumz diaper since we're expanding our stash slowly. Like one diaper at a time slow. Plus I love trying different brands. We cloth diaper part time and I would love to do it more, but we don't have enough diapers, so another one would be useful. I've heard a lot about the amber necklaces and would like to try one. I have been just waiting to try amber! it would be nice to give that a try! I want both of these for my friend who just had a baby. I would love to win because I'm just starting to cloth diaper, and am a new crunchy mama, and want to find out what it is all about! I would love to win the necklace for my new baby girl, my son loves his! And we have never tried this brand of diaper! I haven't tried this brand of diaper or have a baby amber necklace. Thanks for the chance.